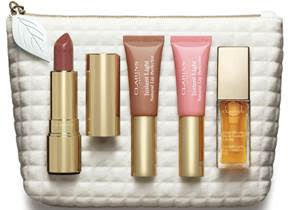 I love Clarins, I love their foundations, their skincare is amazing and the lip products.... well the lip products are delish. I have a strong and dedicated relationship with the Instant Light Lip Comfort Oils. I have one beside my makeup. I have one in my handbag. I would quite happily wear one around my neck close to my heart if I could get away with it (that would be both weird and awesome). I have never been the biggest fan of Clarins eye shadows, they are soft and pretty and give a watercolour wash of colour to the eyes but for some reason I have found them a bit MEH. For the past few Christmases Clarins have released a eye shadow palette "The Essentials". The previous palettes were very pretty but neutral. This year The Essentials* palette is ready to let its hair down and go a little bit funky. The packaging is sturdy cardboard and the eye shadows can be removed if you wish to use the box for keepsakes. There is a brush included with the palette, its a nice functional brush but the size is quite small but its an improvement on previous years. The sparkle on the palette might call for precise placement so maybe the reason for the small brush. The packaging is similar to previous years except this years has a beautiful flower design on the front. Clairns have a tree planing project and when you go to the website and enter the code "Planttree" a tree will be planted. The palette costs €43 and has 10 shadows (which breaks down to €4.30 per shadow). Unlike previous years this year has more shimmer and more colour. The vibe is more purple jewel tones and definitely ready for a sparkly Christmas. The first few shades are more subtle (although the second shade is probably my favourite in the palette with a beautiful iridescence). You can use the second half of the palette for a sophisticates but shimmery night look. The shade at the end is a beautiful black with ruby sparkles. There are some really shimmer shades that you can push onto the middle of the eye lid for a beautiful look. 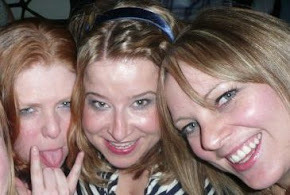 There can be some fall out during the evening but a little glitter on the top of cheekbones makes for a nice highlight. Its the nature of glittery shadows to have a touch of fallout, if you use a primer that wont happen. To go along with The Essentials eye palette there is a limited edition Instant Light Lip Comfort Oil* with the same flower motif. Its so pretty I could hang it around my neck. I always associate Clarins with Christmas, it might be the signature red packaging, it might be because my first Clarins purchase was one of their Christmas sets many (many) moons ago. Clarins Christmas gifts are a great way to grab your favourite product and try a few new ones all at a great price. 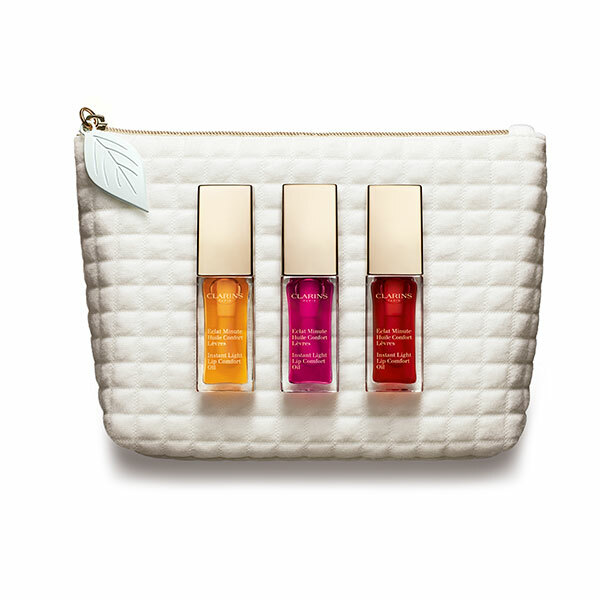 Some of our favourite Clarins gifts this year are Sparkling Lips Collection €45 (which contains 3,5g Joli Rouge Lipstick #705 Soft berry, 5ml Instant Light Lip Perfector #06, 5ml Instant Light Lip Perfector #01, 7ml Instant Light Lip Comfort Oil honey #01 and a makeup bag). Clarins lip products not only feel amazing but they are also beneficial and have treatment and anti aging properties for the lips. Due to my love ot the Lip Comfort Oils I have to mention Sweet Lips Collection €39 (which contains 7ml Instant Light Lip Comfort Oil Honey #01, 7ml Instant Light Lip Comfort Oil Raspberry #02, 7ml Instant Light Lip Comfort Oil Redberry #03 alll in a bag). We cant mention Clarins without talking about one of their skincare sets. We are huge fans of Double Serum (I try quite a bit of skincare "for the blog" and Double Serum is one of those product that I used to the very end, then turned the bottle upside down praying to the Clarins gods for more. Its a beautiful product and your skin will love it). The Double Serum Anti Ageing and Radiance Essentials set costs €70 and contains a Double Serum also sample sizes of Instant Smooth Perfecting Touch and Gentle Refiner Exfoliating Cream in a festive makeup bag.